They Say it is a Yankee Dish, but Tomato Gravy Tastes ‘Purty Danged Suthren’ to Me! Sauté two large sliced tomatoes in two Tbsp. butter, turning once to be sure both side are cooked. Stir in two tablespoons of flour and cook for a few minutes. Add a cup of milk and blend in. 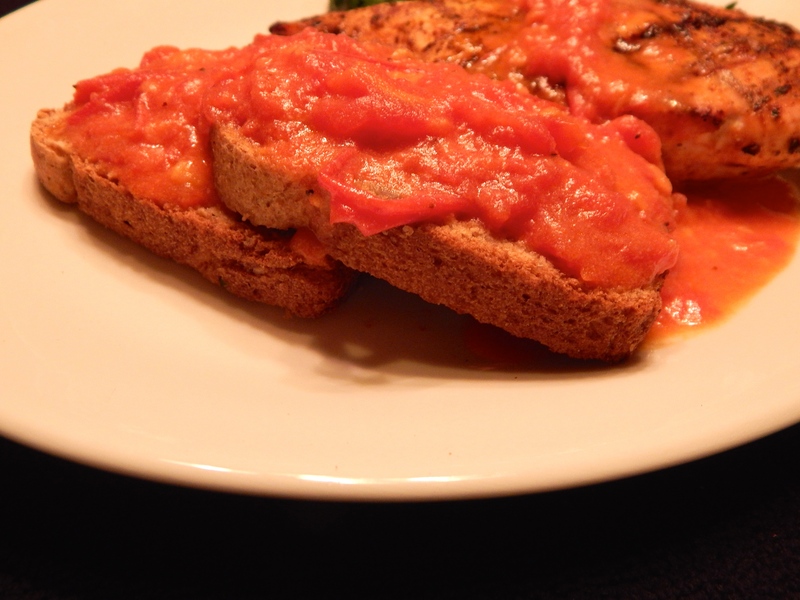 Tomato Gravy on Toast. A new taste treat destined to be a favorite here! My friend, Darryl, wrote about memories of tomato gravy on his blog, From the Family Table. He shared the simple recipe and I had to try it! So very good with garden fresh tomatoes. He talks about tomato gravy on toast as a light lunch. I used it as a side dish with grilled chicken breast and chard steamed with garlic chips. Darryl says it is a northern dish likely created during the depression. I think he’s spent enough time in the deep south for this to taste pretty southern, too, thanks to Susan and her East Texas heritage. I’ve another idea for tomato gravy I hope to share this weekend and then it will be featured in Dinner in the Doublewide! Tomato gravy on toast, grilled chicken breast with chile lime rub and a splash of tomato gravy and steamed chard with garlic chips. Fall brings great tastes to the table. Scored Again at the Used Meat Bin!!! I call the reduced for quick sale bin at my market the used meat bin. It raises some eyebrows and gets some grins. When I find the exceptional bargain there, I’m all grins! 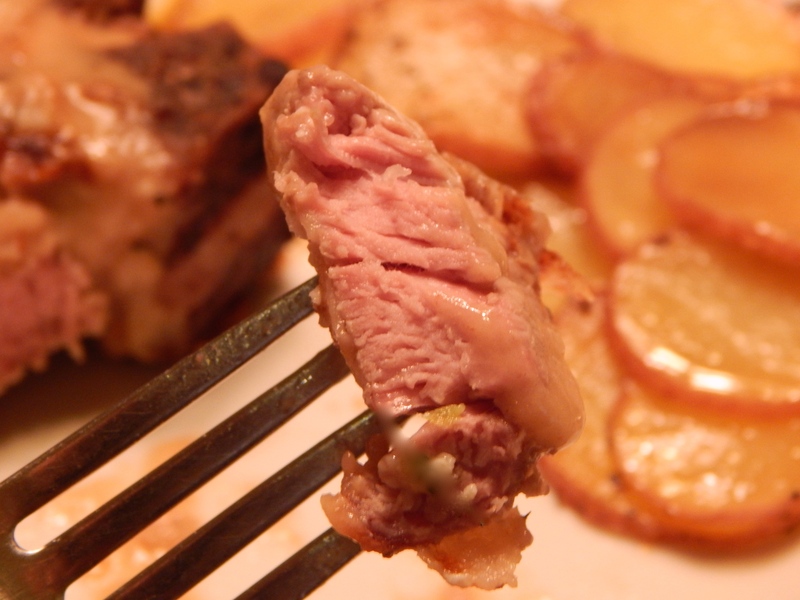 This week, the great treasure was a pack of two beautiful pink veal chops. Even with the markdown they were an extra special treat. Veal chop at medium rare pink perfection. I lightly breaded the chops and gently sautéed them to a golden brown and an internal temp of 145. While the chops rested, I made a pan sauce with a dab of butter, a splash of chardonay and the juice of half a lemon for a dry, slightly acidic compliment to the veal. Had I added capers it would have been close to my picatta sauce. The sides were pan fried baby red potato coins and my favorite fall and winter salad – Honeycrisp apples and fennel on romaine dressed simply with apple cider vinegar, olive oil and a little salt and pepper. Gorgonzola crumbles and chopped fennel fronds are the perfect accent for the apples and fennel. Honeycrips just hit our markets this week. If you haven’t tried them, you are missing the best eating apple ever!!! 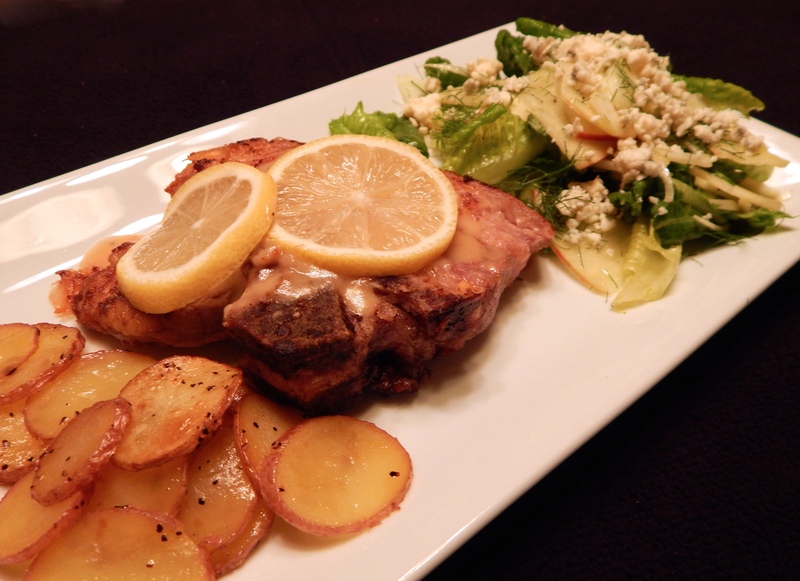 The plate: potato coins, veal chop with lemon and chardonay pan sauce and lemon slices and Honeycrisp apple and fennel salad topped with gorgonzola crumbles. Ha ha! We have snuck into our Dad’s blog to show we have some tricks up our sleeve too! 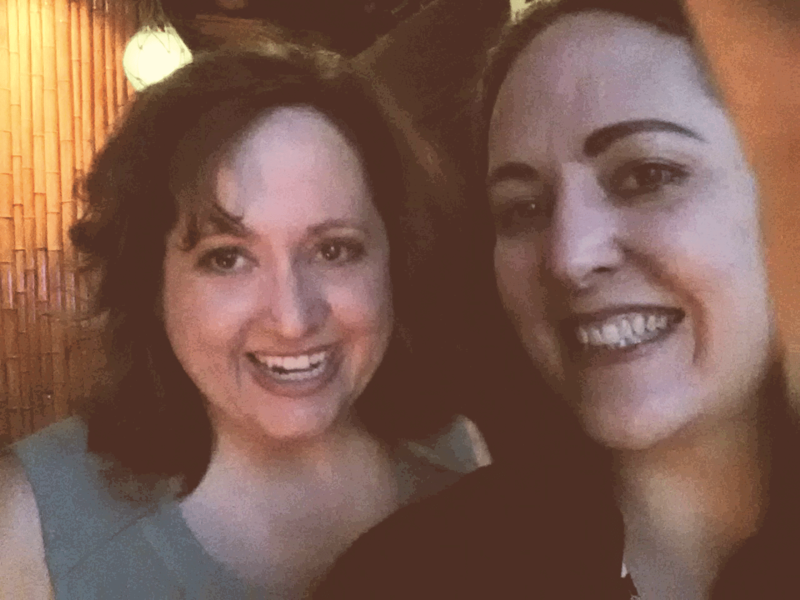 Last night the Gringo Gourmet’s daughters experimented with some Pueblo Poppers! This past weekend we took a trip down to Pueblo, Colorado for their annual Pueblo Chile Festival, and there was a new pepper on the scene! They are a new strain made from the yummy Mira Sol pepper, made especially for stuffing. Like our daddy, we can’t resist chile, or stuffing, or a new and exciting culinary adventure! First we had to inspect these new peppers! Turns out they are very similar in texture to a green bell pepper, with just a touch of heat like a jalapeno or green chile. 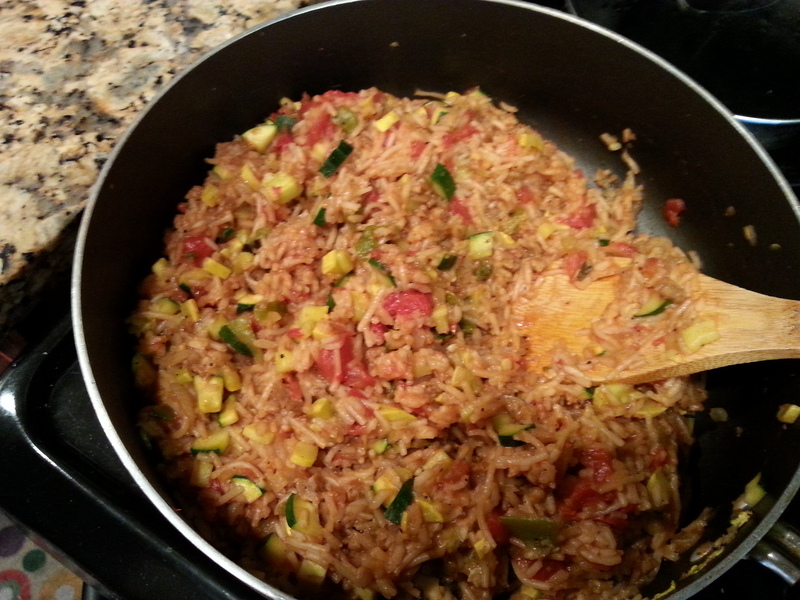 We decided to stuff them with some Spanish rice mixed with some zuchhini, yellow summer squash, some veggie crumbles, and some shredded colby jack cheese. These tricky peppers don’t stand up straight as well as a bell pepper, so we put them all close together in a pan to hold each other up. We put them in the oven to bake until the top of the rice mixture was brown and a little crispy, and the peppers were cooked soft enough to eat easily. While we waited for that to happen, Mande had thankfully thought ahead and prepared some traditional jalapeno poppers to tide us over. 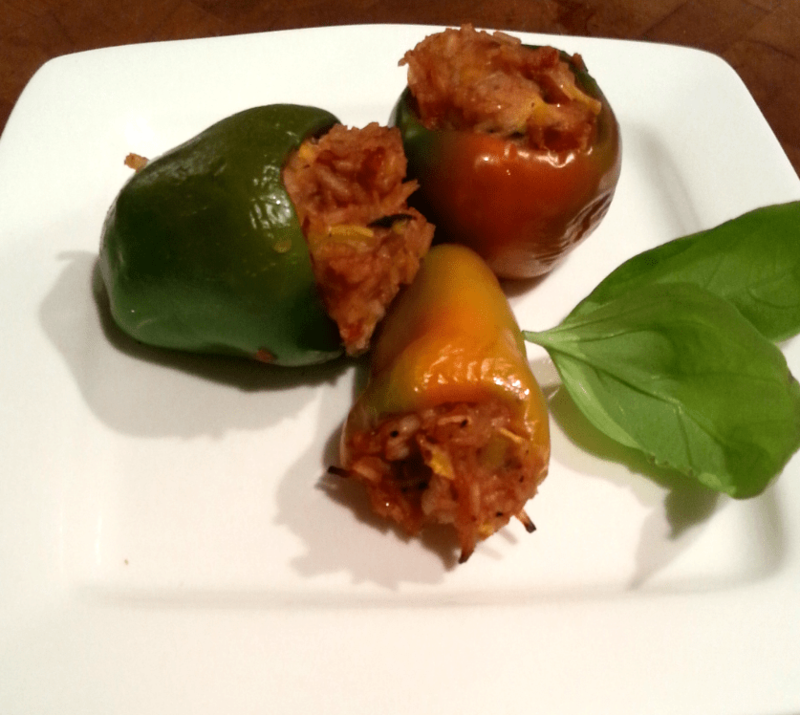 Because what goes with stuffed peppers better than smaller, hotter stuffed peppers?! 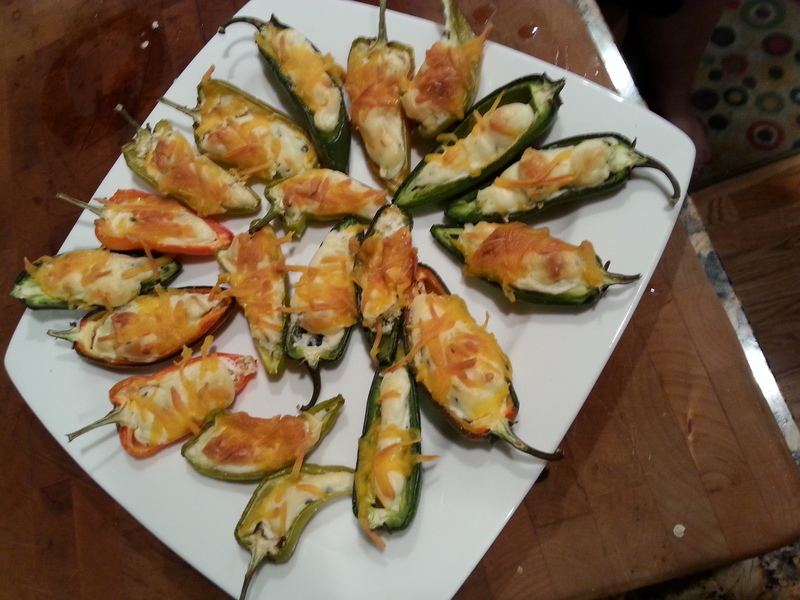 These are jalapenos that are halved, hollowed out, stuffed with chive cream cheese and topped with cheddar. Baked in the oven until crispy, and so delicious that Emily pretty much licked the plate clean. 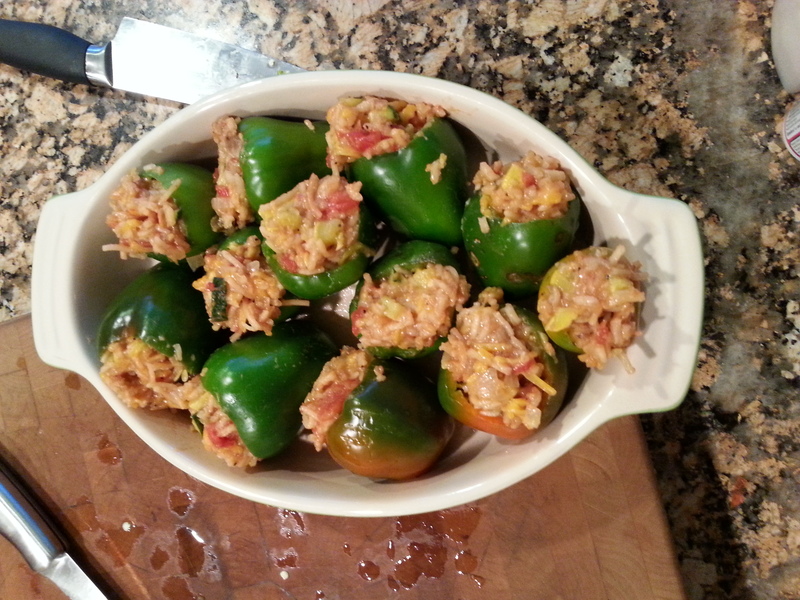 After we had devoured the jalapenos and taken to measures to cool our palates, the stuffed Pueblo Poppers were ready! They looked great, and tasted even better. They had just a hint of heat that complimented the flavors in the stuffing… well except for that longish pepper you see in the front of the plate. 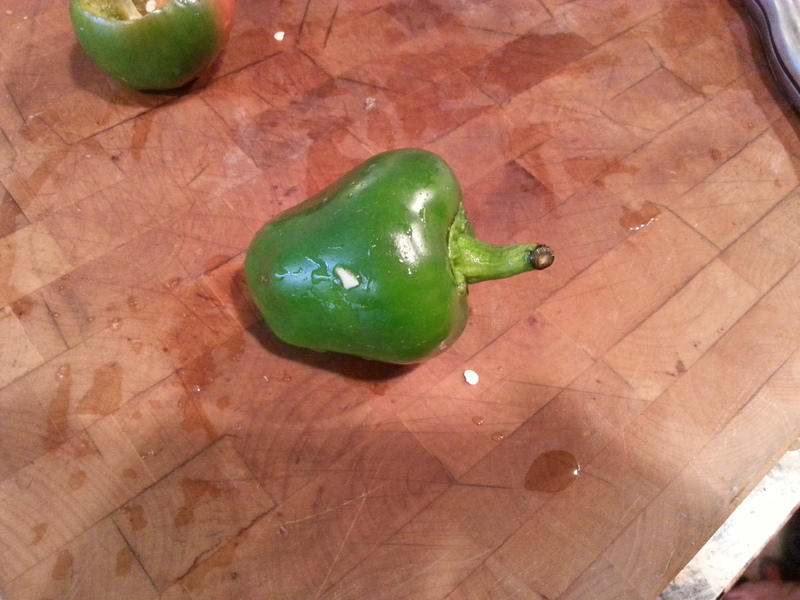 Turns out that was NOT a Pueblo Popper. 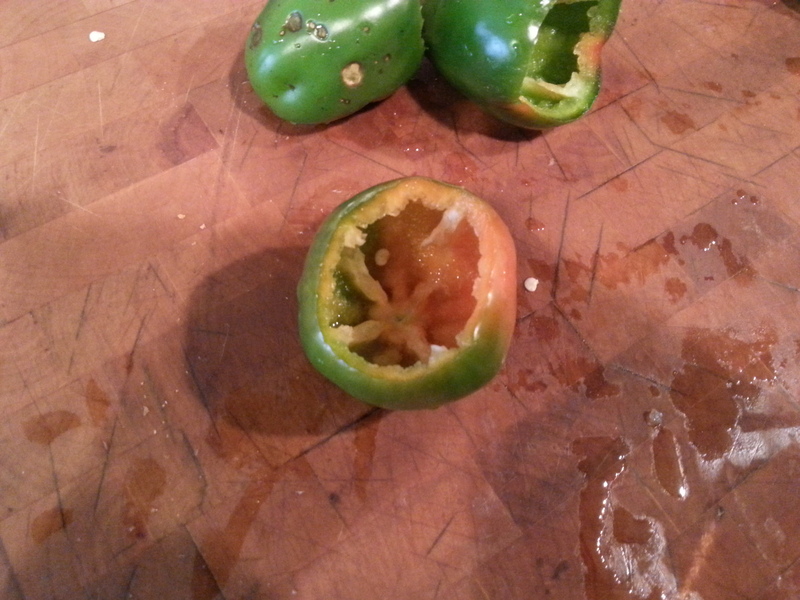 Mande discovered quickly that it was actually an overgrown, fire-hot jalapeno that had accidentally been tossed in with the Poppers! As flames shot out of her mouth and nose, Emily dug into the actual Poppers and declared them a success! After all these peppers, we had a lovely dessert of Tropical flavored TUMS! But it was all so delicious, it was well worth it! Squashed and chopped squash and a chop for dinner. 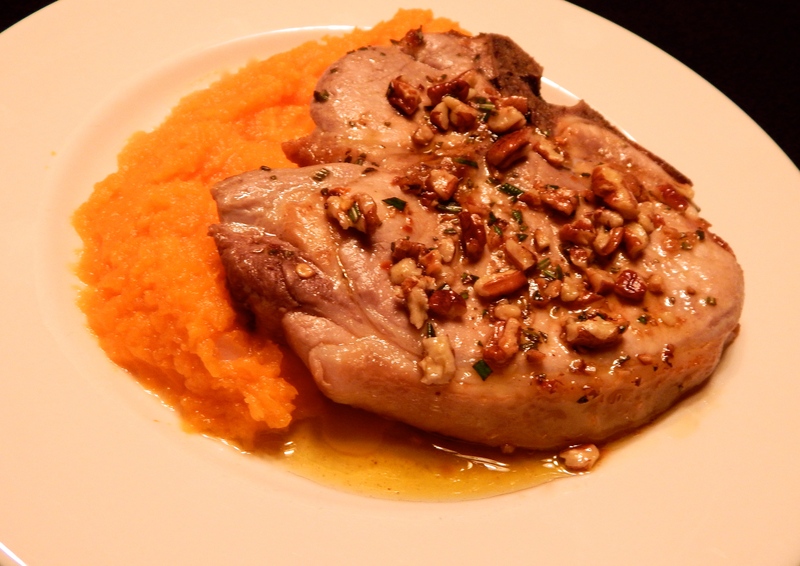 Squash and chop describes both the elements of this plate and their preparation. Butternut squash, halved, seeded and steamed in the microwave with a little (about an inch) grated fresh ginger in the water in the dish takes on a delicious but subtle flavor. When done, peel and “squash” it with a potato masher or puree it with a stick blender. For a marinade and sauce, chop 2 Tbsp fresh rosemary and “squash” a garlic clove into a paste using the side of your knife blade. Stir rosemary, garlic paste and 1/2 tsp red chile flakes into 1/3 C olive oil and 2 Tbsp soy sauce. Separate a couple of tablespoons of this mix and set aside. Baste an inch thick center cut pork loin chop on both sides with the marinade and place on a foil lined rimmed baking sheet. Broil 4 – 5 minutes, turning once. Baste again when turning the chop. Remove from broiler when the chop reaches an internal temperature of 145 in the thickest part of the chop. Tent the chop with foil and let it rest for five minutes. While the chop rests, stir 2 tbsp chopped toasted pecans into the reserved marinade. Place the chop on top of the squash and spoon on the sauce. Still cloudy, a little rainy, breezy and a high in the 60’s. 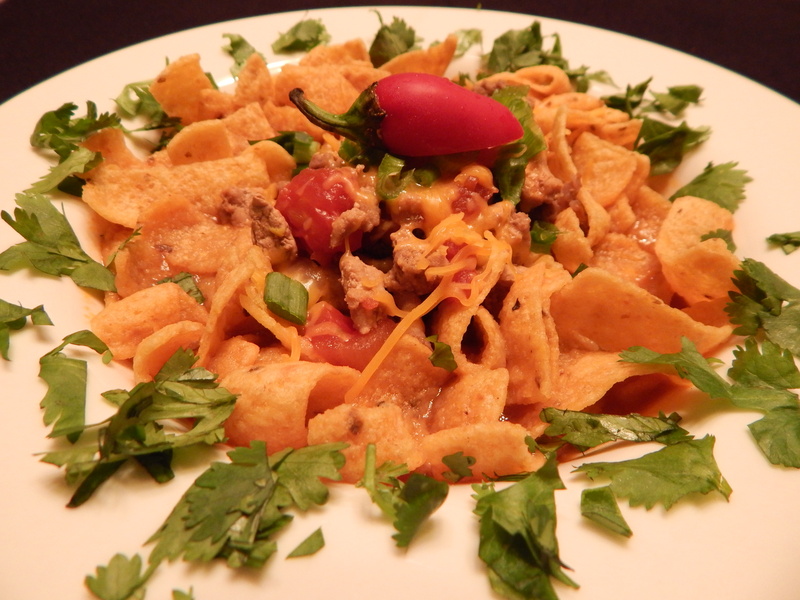 Time for an old favorite from the comfort food arsenal – Frito Pie. I love Fritos. I can eat them by the bagful anytime. I rarely let them in the house for that very reason. I remember nickel bags of Fritos and stores and food stalls that would cut open the bag, add a big spoonful of chili con carne and a sprinkle of shredded cheese for an extra dime and hand it to you with a plastic spoon. My first love affair with Frito Pie. Now, Fritos are $1 and up a a bag. The bags are bigger, of course, and I make my own chili con carne. More often than not, I convert my chili and Fritos into a more adult version of Frito Pie. It’s a little more sophisticated than a tiny bag of chips and chili, but it is still rock solid comfort food that can’t be beat. My chili is a mix of onion, garlic, ground beef, ground pork, several kinds of powdered chile’s and a little cumin in a beef broth base with tomato sauce and, sometimes, diced tomatoes. Usually, I’ll add a can of rinsed pinto beans. Not competition chili, but still very good. I serve a couple of ladles of chili in a wide shallow bowl, tuck Fritos around the edge and garnish with cilantro and chopped green onion an dig in. I had some little jalapeños, so I added one for the picture and a couple of extra zingy bites with the chili. Maybe I’m regressing to the days when joy was a glass of cold milk and a little bag of Fritos for an afternoon snack, but I still like milk with my Frito Pie – even better than beer! The delicate curry scent and the crisp crunch of fenugreek micro greens are a perfect accent for curried salmon, brown rice and sesame vegetables. Sometimes, a curry hits the spot. 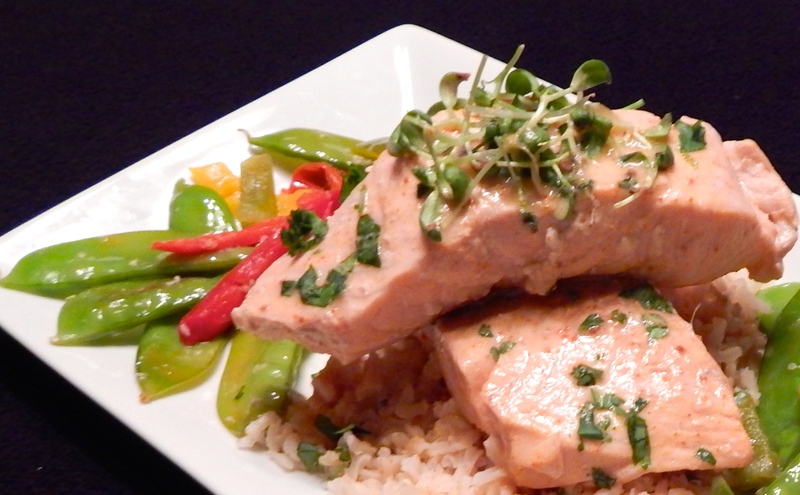 Last night it was salmon poached in a broth of Thai red curry paste, brown sugar and lite coconut milk. When the salmon was done, I added a teaspoon of rice vinegar to the curry sauce and reduced it to serve along side the plate. Long grain brown rice – real rice that takes 45 minutes to cook, not Uncle B’s instant, thank you, – snow peas with mixed sweet pepper sautéed in dark sesame oil with toasted sesame seed rounded out the meal. Chopped cilantro and fresh fenugreek microgreens garnish the salmon. Fenugreek microgreens have a light sent of curry and add a little crisp crunch to the plate. Thank you, Marianela Milner for introducing me to fenugreek micro greens! Fall resolution: experiment more with micro greens and with curries. Chicken pot pie rethought Gringo Gourmet style. Still cloudy, cool and rainy here. More comfort foot needed. For some reason I was thought of a long standing debate my mother and I had over how to make chicken pot pie. Her’s was always dark meat chicken in a white sauce topped by fluffy white biscuits. It was in great demand by the non-chile eaters at the annual Eastern Star Enchilada Supper for as many years as I can remember. When I started making it for myself, I added peas and carrots and onion to the white sauce with the chicken. My biscuit topping never rises quite as high as I remember hers. The the vegetable addition always got a comment from her, even though she politely finished her serving and sopped her plate clean with a scrap of biscuit. I debated chicken and dumplings vs chicken pot pie yesterday. Being a good Texican, I was having withdrawal symptoms because I hadn’t had any green chile for a couple of days. I came up with the idea of green chile chicken pot pie and got busy. I made a mirepoix (onion, carrot and celery with a couple of cloves of crushed garlic) and added some reduced sodium “Better than Bullion” Chicken Base and water. Then I added browned skin on, bone in, fat trimmed chicken thighs to the pot and let it simmer for a few hours to make a savory stock. At assembly time, I made a thick roux using flour and butter – almost a béchamel sauce, I added a generous splash of half and half and a little milk for richness. That done, I strained the broth, heated it and stirred in the roux until it was smooth and starting to thicken, then I added about a cup of chopped green chile and the diced chicken thigh meat. 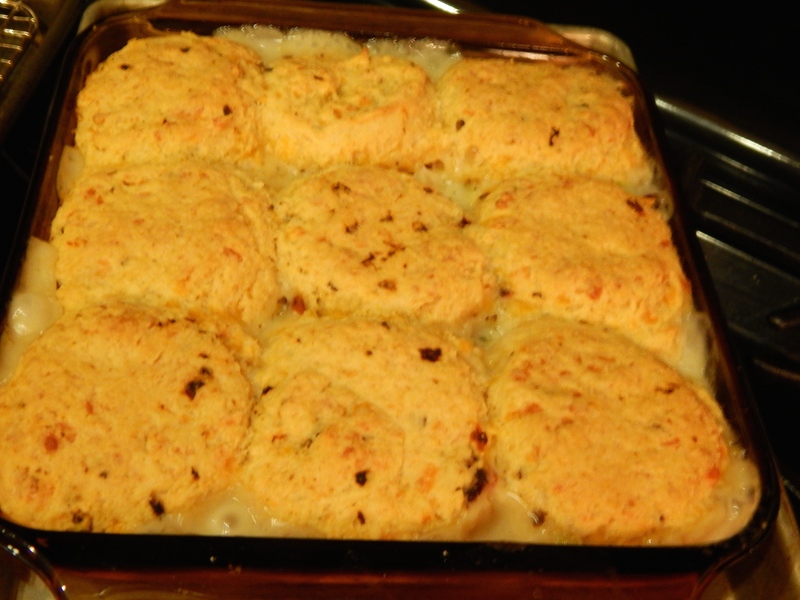 I let it simmer and thicken up while I went to work on my biscuit topping. I tried a new experiment with the biscuits. In addition to the white flour, I added a half cup of corn meal. After mixing the dry ingredients in my food processor, I added a generous tablespoon of minced chipotle chiles in adobo and a cup and a half of cheddar cheese and pulsed it into the mix. Next, I put the mix in a large bowl and stirred in 3/4 Cup of buttermilk to make a sticky dough. A few kneads on the countertop and patting the dough to 1/2 inch thickness and my biscuits were ready to cut and top my Green Chile Chicken Pot Pie. After about 18 minutes in a 425 oven, the pie filling was bubbling and the biscuits were golden brown. A nice bonus was a few extra biscuits that will turn into breakfast this morning! 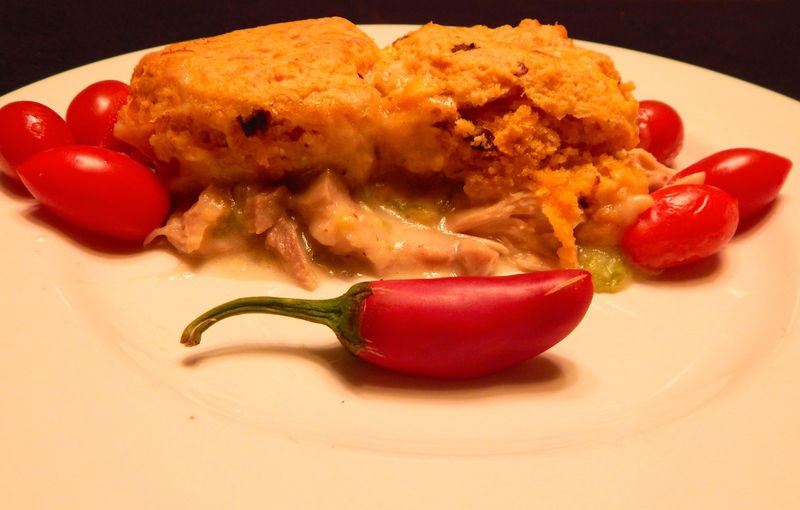 Green Chile Chicken Pot Pie with Chipotle Cheddar Cornmeal Biscuits right out of the oven. 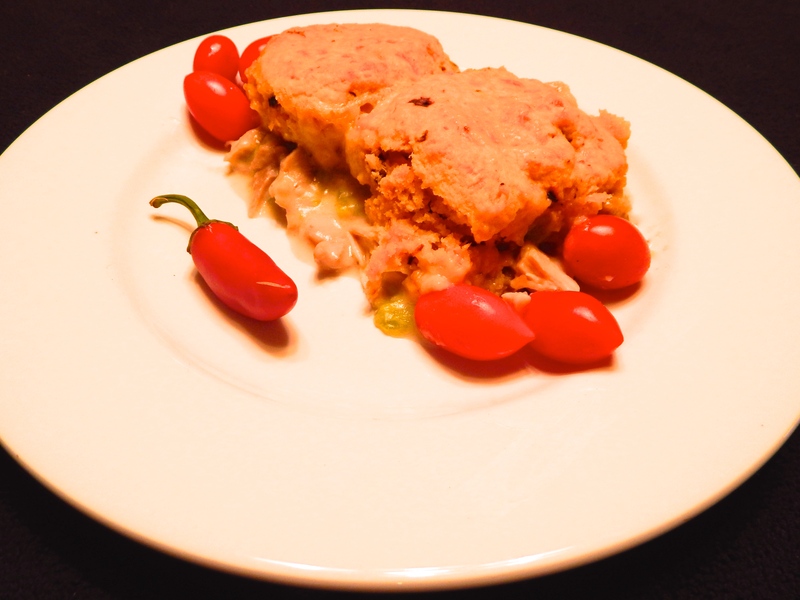 Chile chicken pot pie on the plate with Juliette tomatoes and a red jalapeño for a little color and extra heat! 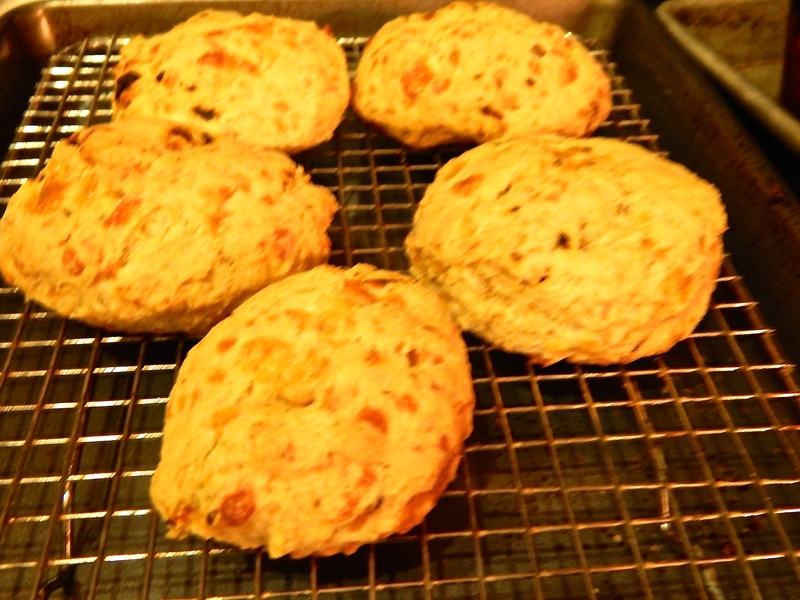 Chipotle Cheddar Corn Meal bonus biscuits destined for breakfast. Rain has been scarce this year. We’re at barely half the average rainfall so far. For the past few days, we’ve been getting moisture from the hurricane that was so bad in Baja California. It’s been cool, cloudy and damp and that means it’s time for comfort food! I wanted something meaty, warm and rich. What fills the bill better than a hearty braised stew? And, what could be richer than short ribs and oxtail braised in dry red wine? Short ribs and oxtail browning in a cast iron Dutch oven. 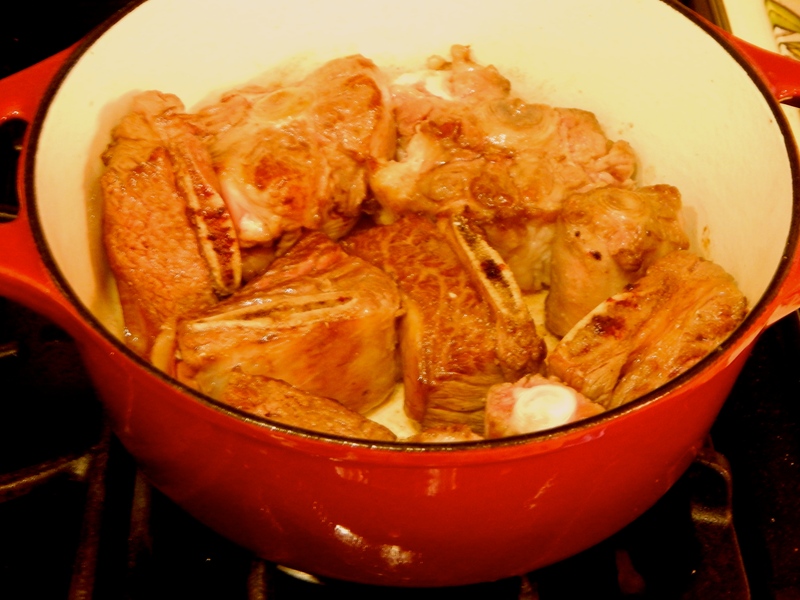 I began by browning the ribs and oxtail, then removed them from the Dutch oven. Next I sweated onion and garlic. When they were soft and translucent, I added a cup of dry red wine and scraped the fond from the bottom of the pot. I returned the meat to the simmering wine and savories, then added potatoes, carrots, sprigs of thyme and three cups unsalted beef broth. When the pot came to a boil, I covered it and transferred it to a 300 degree oven for 2.5 hours. The kitchen smelled better and better every minute of the braise. When the meat was tender, I removed it from the pot and let it cool down enough to handle so I could take the meat off the bones. Ribs and oxtail, while delicious are fatty. As the meat cooled, I ladled fat off the broth and vegetables. That done, I took meat from the bones, returned it to the pot and brought it back up to temperature. 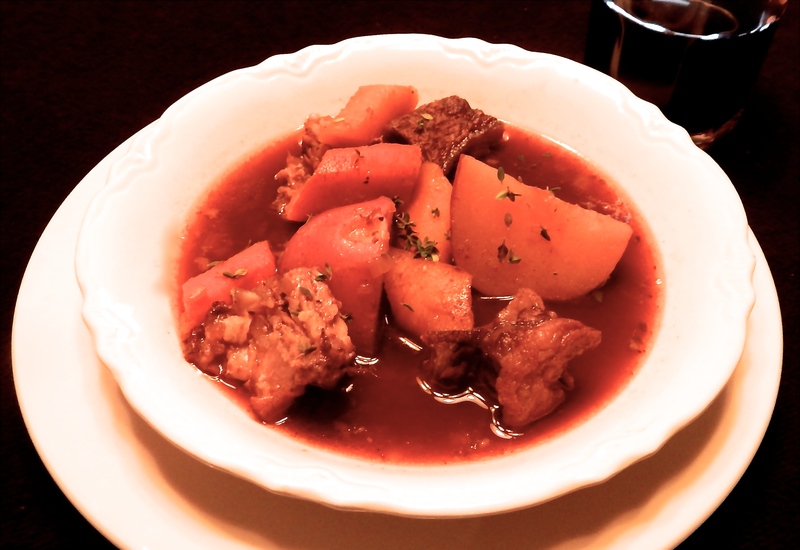 A hearty bowl of the stew with a light sprinkling of thyme leaves warmed the spirit on a cool evening. It didn’t hurt that there was wine left that just had to be used! Comfort food deluxe – braised spare ribs and oxtail stew on a rainy evening. 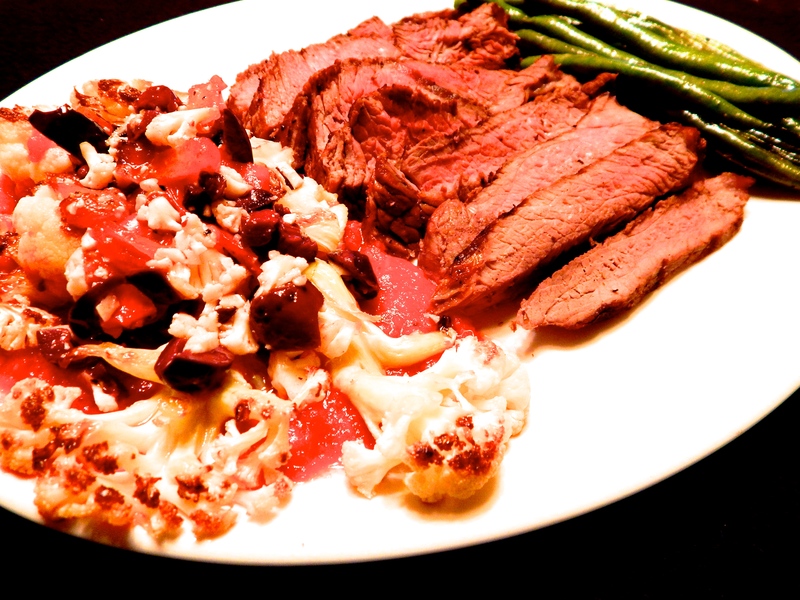 Cauliflower steak, beef steak and grilled green beans. Color, texture and flavor all together on a Tuesday night. A head of cauliflower is a lot even for two hearty eaters. 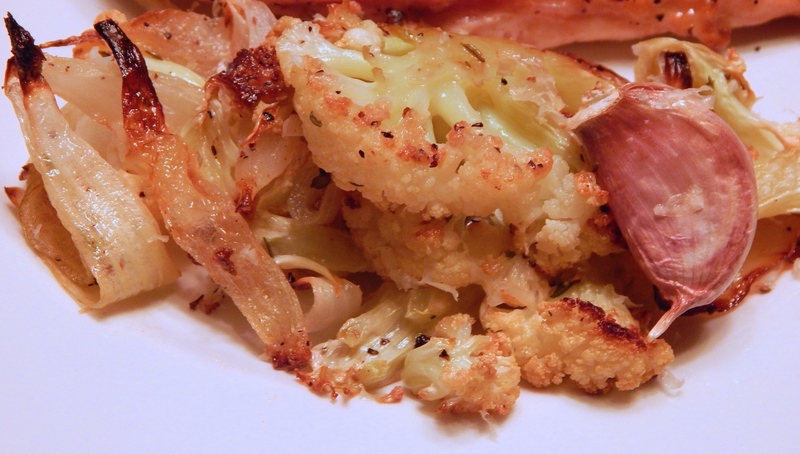 Foretunately, right now there are a lot of seasonal cauliflower recipes floating around. Earlier, I shared how I roasted florets with onion, garlic and thyme as a savory side. My next cauliflower adventure was cauliflower steaks! Cut half-inch slices from the center of the head and carefully brown them lightly on both sides. Transfer them to a rimmed baking sheet. Brown two halved and cored plum tomatoes and three cloves garlic in the pan used for the cauliflower steaks. Move cauliflower steaks and the tomatoes and garlic to a 400 degree oven for about 12 minutes until the cauliflower and tomatoes are tender. 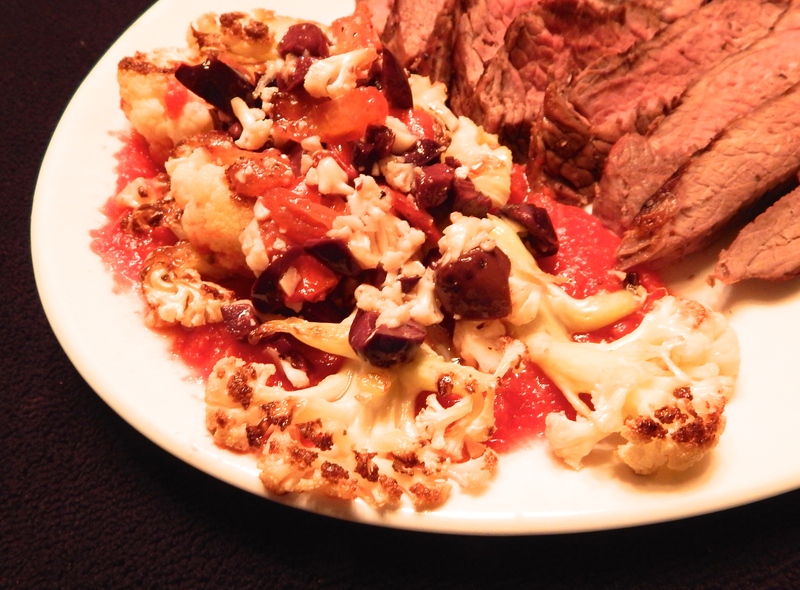 While the steaks and tomatoes are getting tender, mince about 1/2 cup kalamata olives, bits of cauliflower florets left over from trimming the steaks, and three or four sun dried tomatoes. Stir together with a tablespoon of olive oil and a teaspoon of fresh lemon juice and a little salt and pepper to make a relish for the cauliflower steaks. When the vegetables are done, remove from the oven. Puree the tomatoes and garlic with a half tablespoon of olive oil. I like to get a 14 – 16 ounce top sirloin steak for the grill. Seasoned with a brushing of olive oil, a sprinkling of garlic powder and kosher salt and pepper, it grills up beautifully. I slice the steak at an angle across the grain and make two generous servings of rare perfection. There were good looking fresh green beans at the store, and I had to have some. Since the grill was fired up, I thought I’d cook the green beans there. While the beef steak rested, I trimmed and tossed the beans with a little olive oil and seasoned salt. 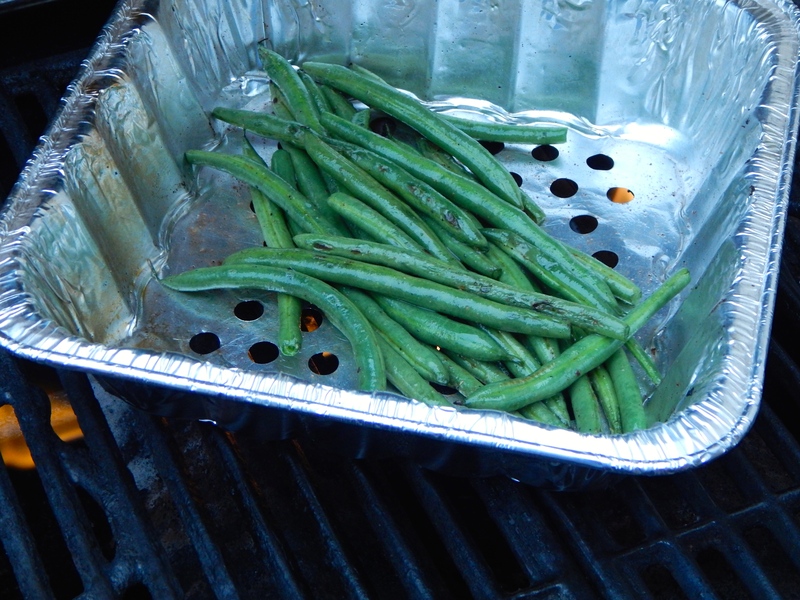 Using a foil grilling basket, I roasted and tossed the beans over a medium fire until they shifted color to a darker green and began to pick up a little char. Done this way, you still get a crisp crunch and great spicy green bean flavor. All together, it made a colorful plate and great mix of textures and flavors for the palate. Had I been thinking, I could have arranged the red meat, white cauliflower and green beans a little differently to create a Mexican flag interpretation for the 16 of Septiembre. Pan browned and oven roasted cauliflower steak on a garlic roasted tomato sauce and topped with olive, sun dried tomato and minced cauliflower relish. A couple of these steaks could make a great entree for a Meatless Monday! Green beans roasting on the grill and just beginning to pick up a little char. Geoff and Kelly Wiseman make exciting jams, jellies and pickles. I love the way they invent new flavor combinations. I recently tried a jar of their “Savory Apricot Jelly.” Apricot, onion and bits of red bell pepper were a good combination, but a little too savory for spreading on a biscuit for my taste. I felt it needed a little more substantial base to balance the flavors, so I used it as a glaze on grilled chicken breast. Two bastings at the end of grilling made a great finish for the chicken. The sugars in the jelly and veggie bits ripened on the grill and suited the chicken breast perfectly. 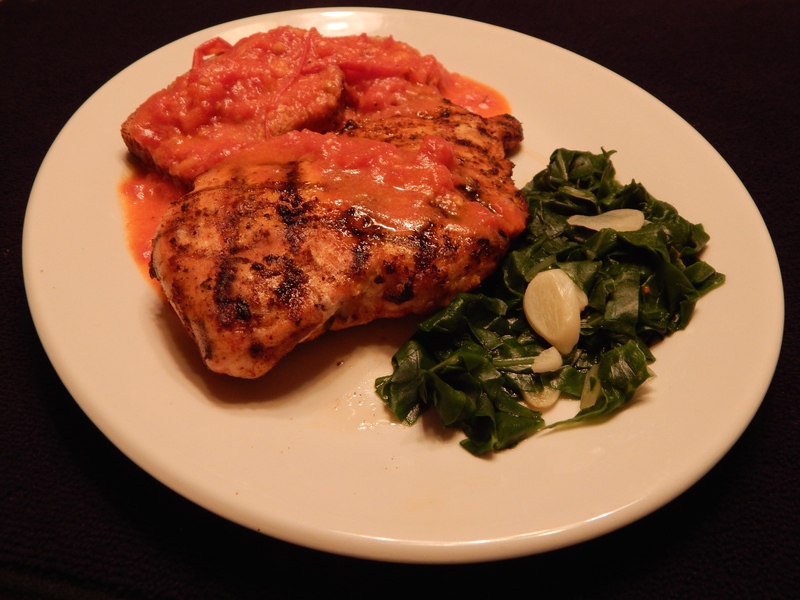 Wiseman’s Garden Creations Savory Apricot Jelly makes a perfect glaze for grilled chicken breast. 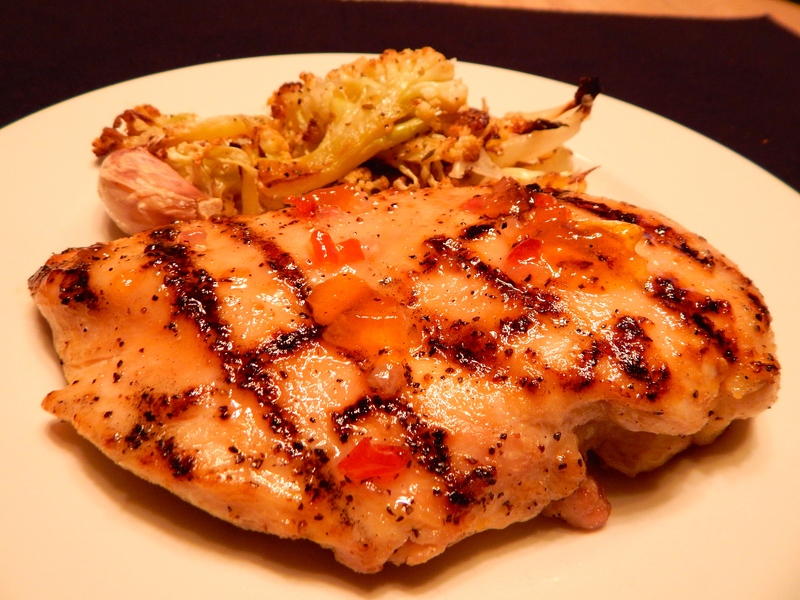 Grilling ripens the natural sugars in the onion, pepper and apricot bits and the sweet base enriches the chicken. I really enjoy cauliflower. Sometimes I steam it, puree it and add a little butter and milk to make fauxtatoes – a carb free mashed potato substitute that is very tasty. Roasting cauliflower makes magic on the plate. It’s a whole new taste experience. I roasted sliced cauliflower florets, small wedges of onion, unpeeled garlic cloves and fresh sprigs of thyme all tossed with olive oil, for 30 minutes at 425. The cauliflower was not quite tender and the onion was getting a little char at that point. I sprinkled grated parmesan cheese liberally over it all and returned it to the oven for about five more minutes until the cauliflower was done and the cheese a little melted. Earthy roasted garlic squeezed from its skins was the perfect accompaniment for both the sweet and savory chicken breast and the roasted veggies. This will be a fall favorite around my house!